Last issue we discussed alternative energy. This time we would like to help eliminate some of the mystery and confusion that occurs when sizing a portable generator. Obviously Y2K has prompted an influx of power loss concerns, but generators have always been used with submersible motors. Safety First: If you are adding a generator for Y2K or other emergency power needs to your present power supply, you must follow all local, state, and national electrical code requirements. One of the most commonly overlooked safety devices is a TRANSFER SWITCH. A transfer switch is required by the National Electrical Code (NEC) and is used to isolate the utility electrical supply from your generator. If this is not done, your generator can backfeed into the utility lines causing serious injury or death to you, your neighbors, or utility work crews. In addition, always read and understand the manufacturer’s instructions. Properly ground your generator per manufacturer’s instructions and local electrical codes. Also remember, generators use fuel to operate. Proper ventilation is required for exhaust fumes, and never re-fuel the generator while running. Why a generator: During construction of a home or building, there is always a need for water and electricity. Water is needed for cement and mortar, and electricity is needed for power tools. Sometimes the construction site will have a temporary power drop from the utility company, but it may take weeks or months just to get on the waiting list. In these cases, using a generator can speed the building along before utility power arrives. We have spoken with people on our Hotline who moved so far off the grid that utility power may never arrive. Generators are one option for providing power in these situations. Generators are also used to operate irrigation systems and temporary use systems, like monitoring wells. Proper Sizing: This is probably one of the most confusing topics of the year. Franklin has recently been in contact with some of the most popular generator manufacturers to ask them the necessary specifications for proper generator sizing. According to the information we received, the most important requirements for proper sizing are 1) Identify what items you want to run. 2) Check the start/run watts required for each item. 3) Total the start/run watts for all items and select a generator that exceeds your total start/run watt requirement. Sounds pretty simple. So where does the confusion come in? Confusion: The first point of confusion results from the generators being rated in watts while the motor nameplates list “max amps”. The generator watt rating is actually a volt-amp rating. Therefore, we can simply multiply the motor max amps times the rated voltage from the motor nameplate to determine the load of the motor. Household size motors have been calculated for you in the table on the next page. A second point of confusion is the starting amps of the motor are much higher than the running amps. In a submersible motor, the duration of the starting amps is only ½ second, but the generator must be able to supply these amps to properly start the motor. Generally, the motor starting amps determine the size of the generator. 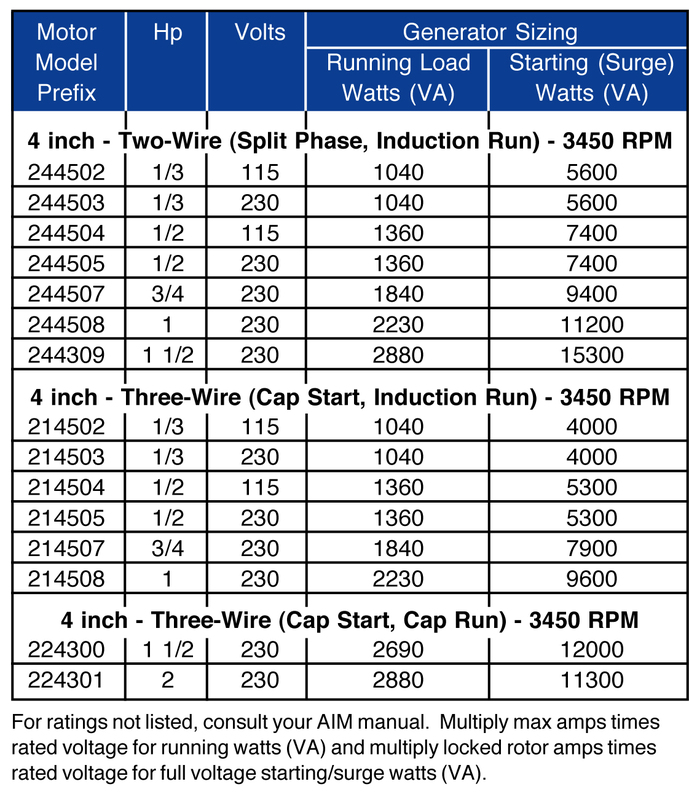 We list the starting amps, under locked rotor amps, in Franklin’s Application Installation Maintenance (AIM) manual, and tabulate the volt-amps of the most popular ratings in the table on the next page. Generator Sizing: The first step is easy: identify what items you want to run. These are typically lights, heat or air conditioning, refrigerators, freezers and water pumps. Some of these items will only run once in a while but you need to account for these intermittent loads per the generator manufacturer’s recommendations. The second step: check the starting watts and running watts for each item. The third step: total the starting watts and total the running watts, then select a generator according to the manufacturer’s recommendations. Generator manufacturers typically list two (2) watt values in their literature. The first is the running load, while the second is the starting or “surge” load. The running load is the continuous watt demand necessary to keep your electrical device running. The starting load is the temporary high power demand needed for initial start-up. Troubleshooting with Generators: Generators can also be used to help determine whether a three-phase current unbalance problem is from the installation or from the power supply. Submersible motors really don’t care where the voltage comes from. Whether from a utility company or a generator, a submersible motor only wants good, clean well-balanced voltage. Three-phase electricity is basically three (3) single-phase power sources all in one. When the utility company supplies three-phase power to your well, they may also be supplying single-phase power for homes, lights, or other single-phase loads. Typically, they try to balance the load across all three single-phase lines, but sometimes one line is loaded more than the others. When this happens, the incoming three-phase voltage becomes unbalanced and the motor amperage can go wild. If you have three-phase current problems you can’t solve and you’ve checked all the connections and system components, then maybe it’s time to rent a generator. If a motor runs fine on generated power, it should run on utility-created power and vice versa. If it runs on one source only, check your other power supply. Note: The corresponding table is designed to provide motor start-up information under normal household conditions. This information will differ from information printed in Franklin’s Application Installation Maintenance (AIM) manual. The information listed in the AIM manual is for absolute minimum sizing, operating the submersible motor only. Under-sizing a generator will cause poor motor starting performance, overload tripping and may cause failure of the motor and/or generator. This entry was posted in Archives and tagged Sizing, submersible motor by copywriterfele. Bookmark the permalink.